Why do polished stones look wet? How does the Twin Paradox work? What if Jupiter were a star? How can we be sure that pi never repeats? How does a quantum computer break encryption? 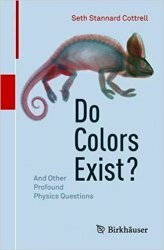 Discover the answers to these, and other profound physics questions! This fascinating book presents a collection of articles based on conversations and correspondences between the author and complete strangers about physics and math. The author, a researcher in mathematical physics, responds to dozens of questions posed by inquiring minds from all over the world, ranging from the everyday to the profound. Rather than unnecessarily complex explanations mired in mysterious terminology and symbols, the reader is presented with the reasoning, experiments, and mathematics in a casual, conversational, and often comical style. Neither over-simplified nor over-technical, the lucid and entertaining writing will guide the reader from each innocent question to a better understanding of the weird and beautiful universe around us.